Figure 1. 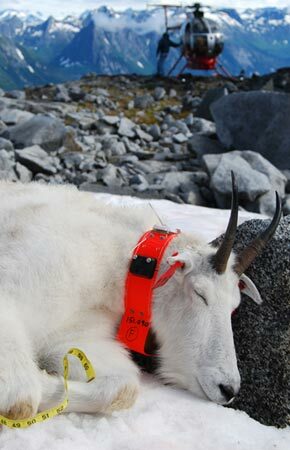 Photograph of an adult female mountain goat following capture and deployment of GPS radio-collar. During research studies mountain goats are captured in order to attach radio-collars and collect biological data and samples. These procedures enable collection of vital information about individual mountain goats in given populations. Capturing mountain goats is very difficult and, in Alaska, generally involves darting from a helicopter. Safely conducting such capture activities requires a highly skilled helicopter pilot and good judgment. 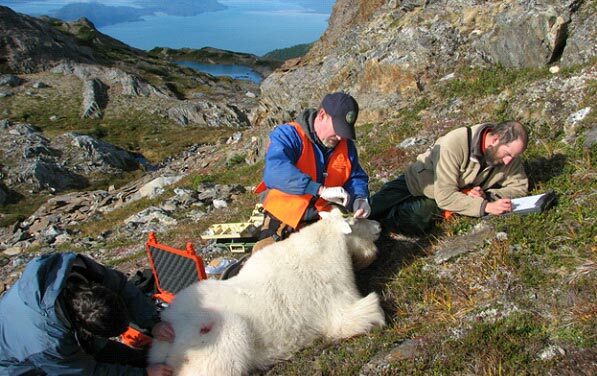 In order to ensure that mountain goats do not get injured during capture activities capture teams are extremely selective and only attempt to capture animals in areas where dangerous terrain features (i.e. cliffs, ravines) can be avoided. Using this approach, ADF&G has been able to safely capture and handle 450 mountain goats since 1977. Once animals are immobilized, radio-collars and ear tags are fastened to the animals and biological specimens and data are collected. Once handling is completed the effects of the veterinary immobilizing agent can be reversed with a second injection enabling the animal to walk off within about 5 minutes. Radio-collars enable monitoring of mountain goats for up to 6 years and thereby facilitate collection of reproduction, survival and habitat selection data over a substantial period of their life. Typically, GPS radio-collars collect a geographic position (latitude/longitude) of the animals every 6-hours for a 3 year period; collars automatically release from the animals just before the battery runs out. The advent of GPS radio-collars has represented a major revolution in our understanding mountain goat movement and habitat selection patterns. Radio-marked animals can also be tracked from aircraft or the ground by honing in on the signal emitted from an ancillary very high frequency (VHF) transmitter packaged in each radio-collar. 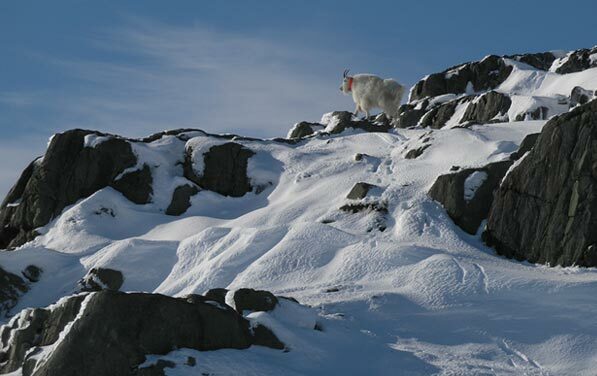 Radio-tracking mountain goats allows for visual observation of individuals and enables determination of reproductive status, survival, social behavior, habitat selection and also aids in population estimation surveys (via mark-resight methods). A suite of biological specimens and data are also collected during handling. Blood, tissue, hair and pellet samples are collected to assess disease and mineral deficiency status, genetic identity, body composition (via stable isotope analysis) and diet. Morphological characteristics are measured providing information about body and horn size. Mountain goats are also weighed manually using a digital scale and customized net. Collection of these data are important for learning about the nutritional and health status of individual populations but also key for assessing differences between populations. Taylor, W.P. 2000. Wildlife capture and restraint manual. Alaska Department of Fish and Game, Anchorage, AK. White, K. S., D. P. Gregovich, G. W. Pendleton, N. L. Barten, R. Scott, A. Crupi and D. N. Larsen. 2012. Mountain goat population ecology and habitat use along the Juneau Access road corridor, Alaska. Wildlife Research Final Report. Alaska Department of Fish and Game, Juneau, AK. Figure 3. Photograph of a radio-marked adult female mountain goat walking away from the capture site shortly after completion of handling activities and administration of the reversal agent.